The TV shows make it all look so easy. Is it really like that? Well, wouldn’t it be great if you could leave for an hour, and your project was done when you came home? In reality, it requires patience and sacrifice from the homeowner. Every project is different, but we do our best to give realistic timelines at the outset of each renovation. Typical timelines are: kitchen remodel: 6–8 weeks; bathroom remodel: 3–5 weeks; basement development: 8–10 weeks; secondary suite development: 3–4 months. These are all variable based on the project though! When should we start planning our renovation? The most successful projects start with thoughtful planning. After selecting a contractor to do the project, you should expect 4–6 weeks to allow for planning and material orders before your renovation starts. Be wary of a contractor wanting to start before custom materials are ordered or you could be waiting a lot longer without a usable space—that’s not so great when it’s the kitchen or your only shower! We plan so that we have plumbing fixtures at our shop prior to starting a project, and cabinetry delivery booked before demolition starts. Are off-the-shelf items at the local home store just as good as custom-ordered ones? There are many types of fixtures, cabinets, countertops and flooring available at any of the big-box home stores in St. Albert. The downside is that they are designed to be flexible enough to suit many different home configurations, styles and budgets, so they might not look quite as finished or refined as you’d hope. If you are planning on spending a significant amount of your hard-earned money on a beautiful and functional new kitchen, wouldn’t you want as much of it as possible to be fit precisely to your space, functional needs and style? 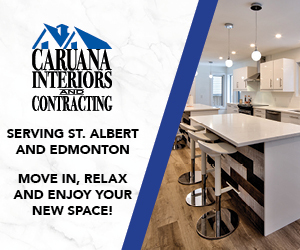 Caruana Interiors and Contracting, located in Riel Park, has just celebrated 10 years in St. Albert, showing their dedication and commitment to the community, as well as the reliability and stability that you need in professional home renovators. Timing is everything! Our typical busier sales months are April–July as more buyers are out in the marketplace, the weather turns nicer and some buyers are trying to transition around the school year. A person may actually make a purchase in April but move into that home in July, so I always recommend to stay ahead of the pack and list earlier in the year to be in front of the most amount of serious buyers and to stay ahead of the heard of other listings that would be considered your competition. What is the major difference between you and other realtors? out among the rest, and I use professional photography, stagers and other service providers every step of the way. Yes, it costs me more, but it gives the seller the best opportunity to get the highest price for their sale. Many other realtors use a camera on their phone, put a keybox on the door, a sign on the lawn and walk away and then pressure the seller for a price reduction after not having any successful offers. You could save a thousand dollars off your commission but then end up selling for tens of thousands less at the end of the day if you don’t get exposure to the right buyers and show your home in the best way possible. If your agent isn’t using all the tools, they aren’t doing enough for you! I am a no-pressure type person, and love what I do! I’ve been selling in St. Albert for over 13 years and appreciate getting the opportunity to help families make their move. Call me today for a relaxed, no obligation discussion on the difference that my knowledge and experience can make with your next home purchase or sale!